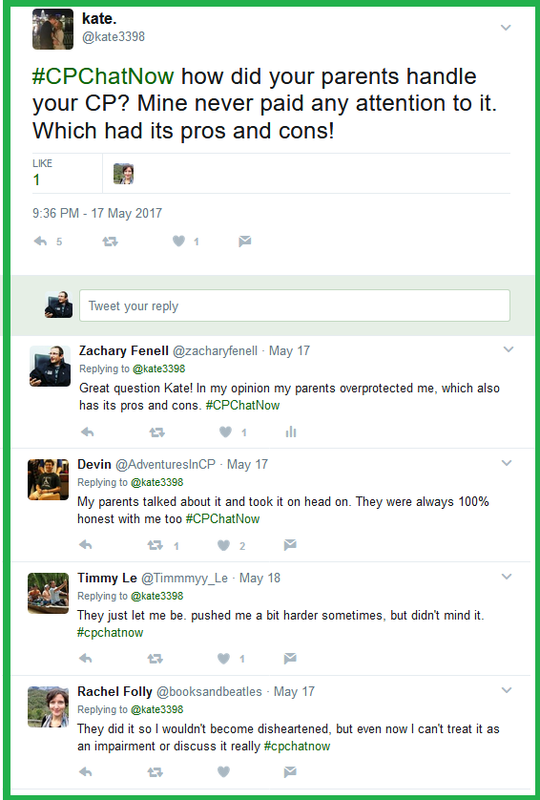 This week’s #CPChatNow Twitter chat was a meandering chat that reflected the busy nature of our member’s lives. There was even a little bit of Español thrown in! 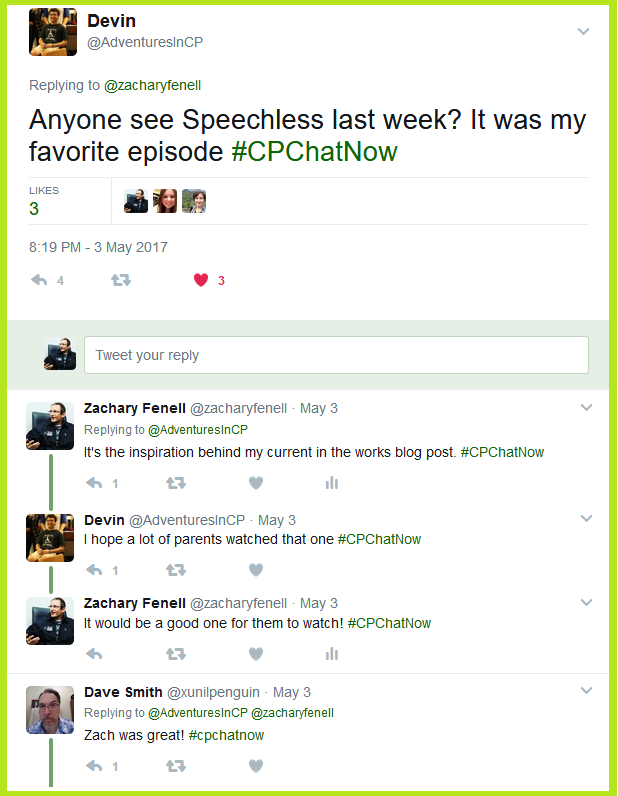 I am #CPChatNow Interim Co-Host, Devin Axtman, and I will be taking you along on this week’s recap. All aboard! 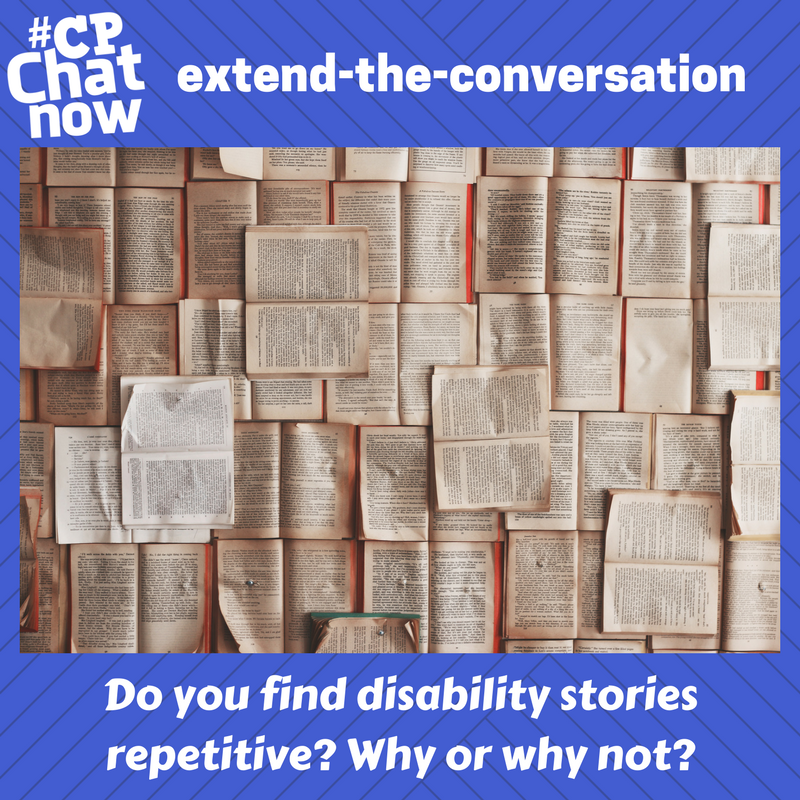 #CPChatNow regular, Jessica, also shared why she felt the common belief that Physical Therapy is simply an extension of personal training is misplaced. She shared this is more the case for adults, while for kids PT is about re-establishing Nuero pathways. 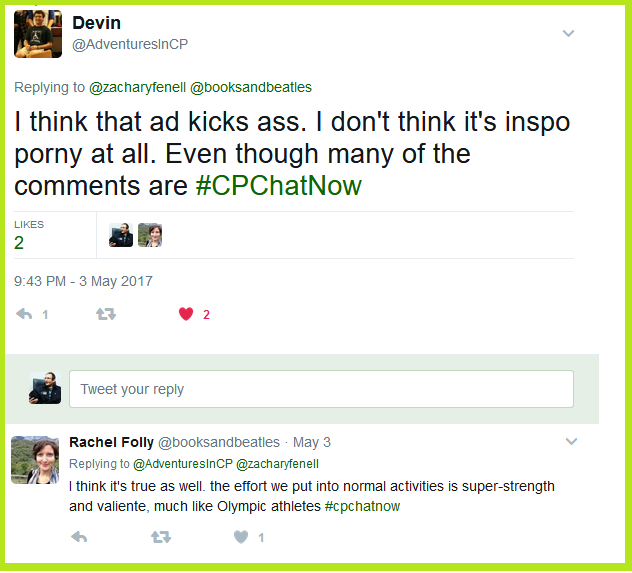 Also, one of #CPChatNow’s founders, John Quinn, stopped by and shared the latest always interesting developments in his life. Seriously, check out his book, Someone Like Me, it is an outstanding description of his life with CP. In some happy news, our #CPChatNow Co-Host now known as Jorge Oteiza, is back from Spain and enjoying some family time, overalls, and a new tattoo. 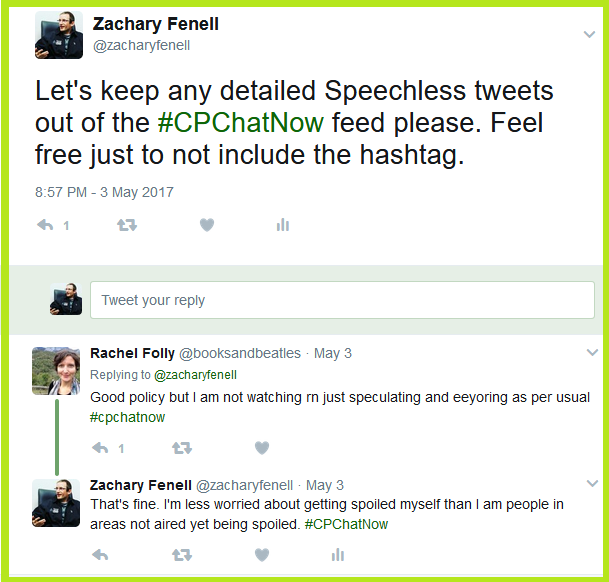 Next, this brings us to the announcement of our focus chat on aging with CP. Please join us tomorrow, Wednesday, May 31st at 8 EST. Finally, I would like to go back to the beginning of our chat for Rachel’s discussion about washing dishes being therapy to our Extend-The-Conversation-Question: What non-traditional forms of therapy have you used? Please join us tomorrow at 8 EST for our focus chat on CP and aging. 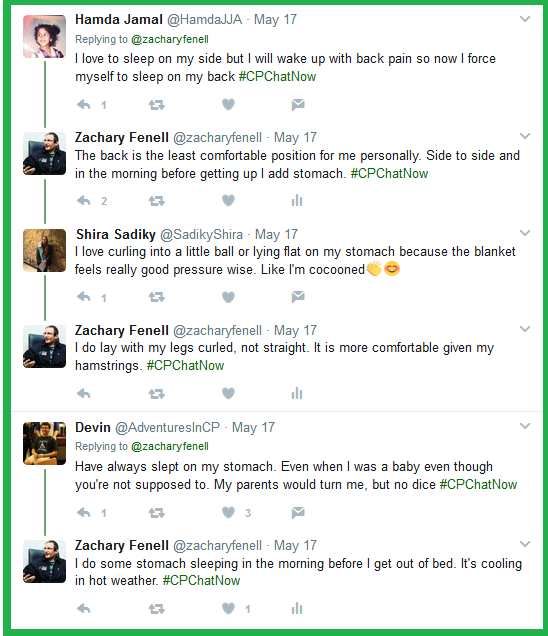 Many interesting topics emerged Wednesday, May 17th, 2017 during the weekly cerebral palsy Twitter chat #CPChatNow. Or at least I, co-host Zachary Fenell, found the subjects intriguing. Go ahead and use this recap to draw your own conclusions. Early on I asked about others’ sleeping habits. Specifically I sought information regarding the positions people sleep in and how many pillows they sleep with. 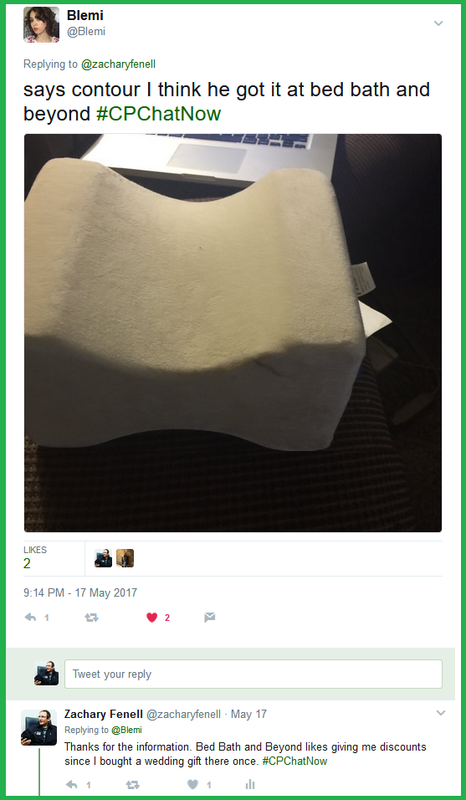 As I revealed in my back and forth with Blemi, curiosity motivated my question. 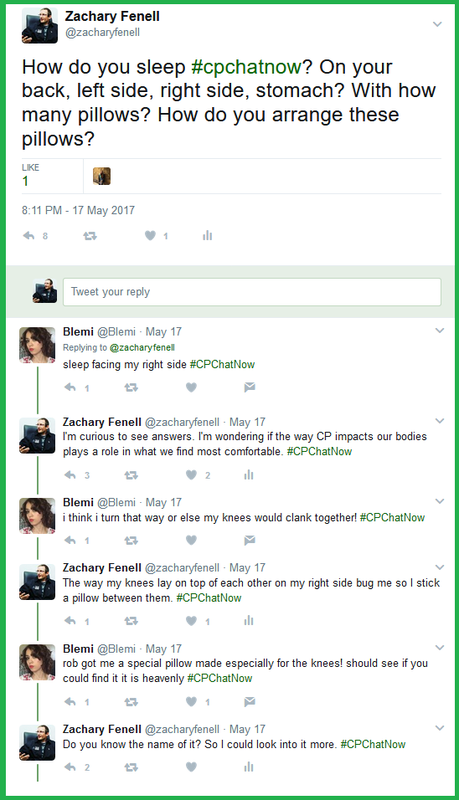 I wondered if CP played a role in the positions we find comfortable. The various responses helped to provide the data needed to make such an evaluation. Overall laying on your side with legs bent seemed the most popular sleeping position. Around 8:30pm ET our May focus chat announcement transitioned the conversation to a different matter. Aging with cerebral palsy proves an in-demand issue. Like the above screenshot shows, participants couldn’t wait until May 31st to start addressing multiple points! We hope you will mark the “Aging with Cerebral Palsy” focus chat in your calendar and join us Wednesday, May 31st. Concentrating back on our May 17th chat, friendly chatter kept the night progressing. This entailed individuals’ to-read lists. Mentioning a cerebral palsy memoir on my own to-read list caused the dialogue to evolve. Interim co-host Devin Axtman noted he considers his life “pretty typical” and not really memoir worthy. Other participants expressed similar sentiments. Going a step further, Devin critiqued the disability stories currently out there. Leave your reply via a comment in the “Comments” section. Perhaps we will even revisit the question during our May Google Hangout. 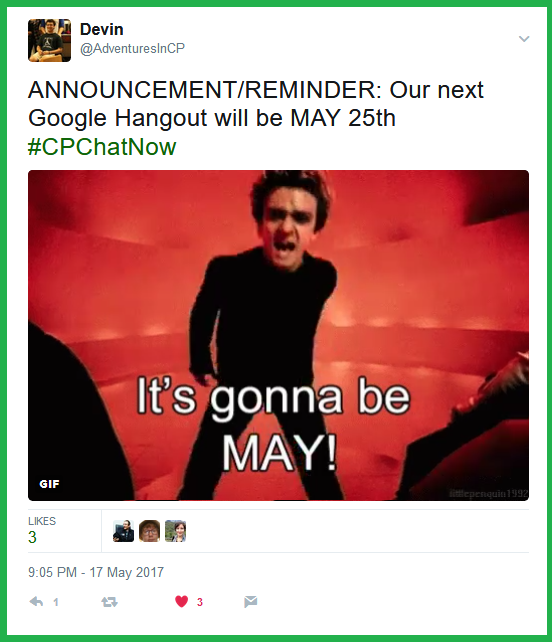 As Devin reminded us, the video chat takes place on Thursday, May 25th, 2017. Towards the chat’s end a younger participant Kate initiated discussion asking others about how participants’ parents handled the cerebral palsy diagnosis. Replies demonstrated varying approaches taken. 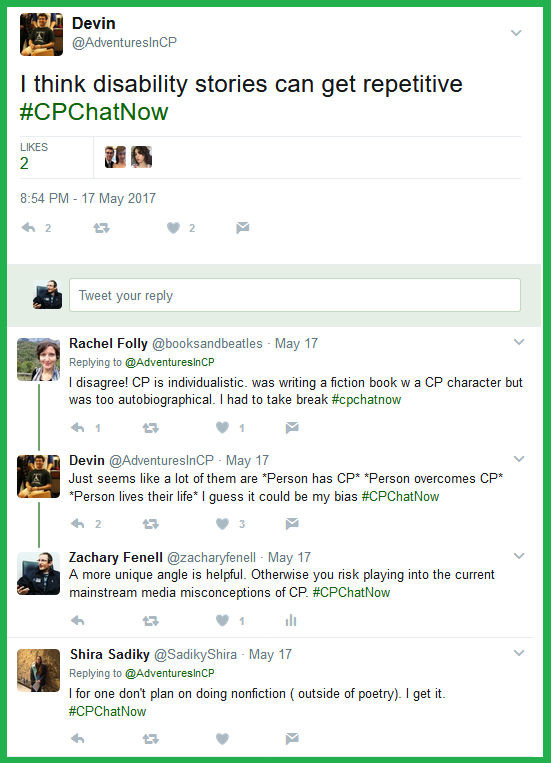 Thank you all for reading and your interest in #CPChatNow. Hopefully you can make tonight’s chat, beginning as usual at 8pm ET. If you cannot participate this week though, please try participating next week on Wednesday, May 31st for our “Aging with Cerebral Palsy” focus chat. Until later remember to answer the week’s extend-the-conversation question.